In the past, I’ve written about how to use Trello for agile task tracking, and also about some tools that allow you to use Trello for Scrum. Recently I started up a little side project for a personal application I wanted to write, and I decided to run the project using Trello and Scrum for Trello as my task tracking tools. In this post, I’d like to walk you through the process of how to configure a Trello board to run a Scrum-like process. The first step in configuring Trello is to set up your Lists on the board. In a Scrum process, we typically have the standard stages TO DO, IN PROGRESS, and DONE for our tasks. If we want to bring backlog planning into the same view, we can do this with a few extra columns. Product Backlog: This is where all the stories start. You’ll see on the board example that some stories have estimates, and some are still being written and aren’t ready for estimation yet. This is where the Product Owner can work to build up work for upcoming sprints. Sprint Planning: This is the column where the team can begin planning for the next sprint without interfering with current sprint activities. More refined estimates can be applied and stories can be broken down. Once estimates are applied, the total points wrap up into the list header to show you the size of the sprint. Current Sprint: The Current Sprint is the work that needs to be done right now. You may also name this To Do or Sprint Backlog. These are the stories that the team can pull from and assign themselves to. In Progress: Stories actively being worked on should be in this list, and the developers working on the story should assign themselves to the card. Developers can also provide an estimate in brackets [ ] of the amount of effort already spent. In my example here, I have been tracking total story points and also estimated story points completed. These values roll up into the list header to allow the scrum master a quick view at progress in the current iteration, as well as on the individual stories. Done: Work completed that has passed all acceptance testing can be moved to Done. You may need multiple Done columns if you want to track which Sprints your work was completed in. If you are working with a split dev/test team, you may also need columns for Deployed, Ready for QA, or In QA to allow your team to track where in the development cycle the story is. Personally, I find too many lists overly confusing so I would recommend trying to keep your stages to a minimum and allowing the team to communicate with each other directly to ensure a story gets done. UPDATE 2015-08-19: Now featured on https://trello.com/inspiration! You can access the board and see it live! User Stories are captured in Trello as a Card. The card can then be used to track details of the story, estimates, and who is working on the story. 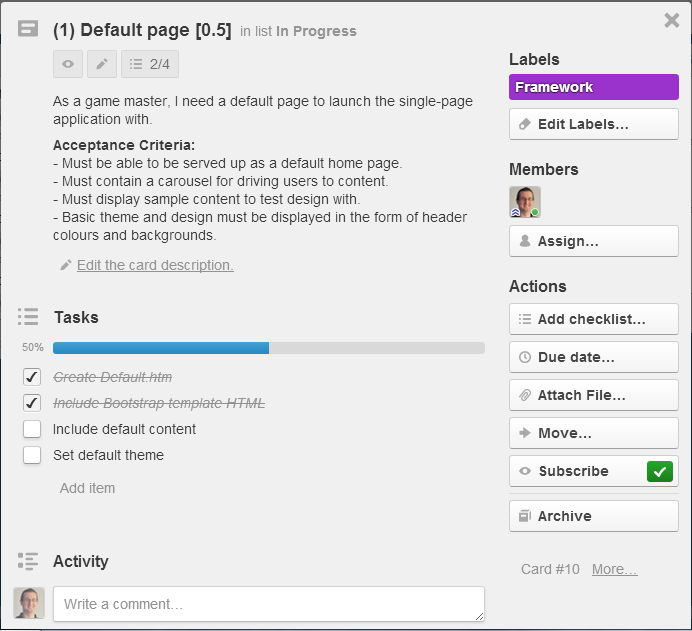 Points: When using the Scrum for Trello plugin, the story points are placed in the title in parentheses (i.e. (5)). Expended effort is tracked in the title in brackets (i.e. ). Tasks: Tasks can be tracked in a variety of ways, but I prefer using the checklist as it has a visual indication of what percentage of the tasks is complete . If you need to track task hours remaining, you may want to consider splitting stories down into task cards instead, as tracking hours remaining in the checklist is less than ideal. Themes/Epics: I recommend tracking your themes/epics by using the Trello Labels functionality, but due to Trello’s limited number of labels, this may not be appropriate for your project. Instead, you may consider using Labels for task types (Bug, Feature, Impediment, Spike) and writing your Theme/Epic name into the title (i.e. Framework: Default page). Story Details: The description field allows you to provide details on the story. You may wish to place acceptance criteria here, as well as the user voice form for the story. Trello also supports attaching files, so if you have visual designs, specs, detailed notes, etc. they can be attached to the card. You will notice quickly that as your project size scales up that Trello becomes more and more difficult to manage. It is intentionally constructed to force you to make decisions on what will be next, thereby keeping your work in progress batch small to improve efficiency. This is great when tackling things at a sprint level, or when working on a small project that will only have a few sprints. However, if you need to scale up to something larger, you will need to consider a different approach. With a multi-release project running several teams or several years of iterative development, the backlog size is massive. Managing this on a single board does not work. This is where you will want to split your work across boards. Investment Decision Board: This is where the highest levels of the organization will track upcoming feature requests and company direction as epic stories on their board. They will have a prioritized backlog of items to consider, and they will need to be evaluated for effort, risk, and business value before passing them on to the product management teams. Product Backlog Board: The cards on this board will be used to track epics that the portfolio management team has decided the company should invest in. At this point, the product management teams need to make decisions on their release plans and where different epics will be slotted. More refined estimations will occur, and dependencies will likely be identified. This is also where the product management team will track architectural epics such as browser version support or framework updates. Release Backlog Board: At this stage, the product management team has decided the current backlog for a given product’s next release. This is where the implementation team’s scrum board comes into play. The scope of the release is in the Product Backlog list, and the team continues plugging away at the work in the current sprint. With your board configured and your stories entered into Trello, you will probably have some need for reporting. You can look into Burndown for Trello which integrates with Scrum for Trello, or you may want to investigate accessing the Trello API to build something to generate the project status reports you need to surface. UPDATE (July 16, 2016): I’ve recently looked into Corello as a cross-board dashboard reporting tool. This may be another avenue you’ll want to look into. Dave, nice to hear from you. In regards to the burndown, there are no ‘units’ associated to the numbers used, so if you need to track hours versus points, you can have your task cards use hours and have your stories at a release level using points. However, I would recommend using two boards for these two views in that case, in order for it to be clear to users as to what unit was being used on the cards. While that does address the hours versus points, it still leaves the relationship between cards as a question. I have recommended using the checklists to achieve individual story progress reporting, but this would not help feed into your sprint burndown report. Task cards can be created, but other than hyperlinking between cards, you can’t create a “sub-card”, which I believe is what you would like to do. That being said, I haven’t missed this part when moving to Trello. My sprint burndowns were intended for me to see how close we were getting to done, and whatever unit is being represented, as long as it was being updated to get ‘closer to done’ the report served its function. In addition, with the visual board the way it is, you can get a quick ‘burndown’ of where you are at with a moment’s glance to see where things are in their different lanes, and also where the task checklists are at for individual stories. Thanks for the good article. I’m using this combination for a number of projects. Trello just gets better as time goes on. Although not directly connected to the Agile aspect I’ve found Zapier very useful to sync and update items with BitBucket (i.e. new Backlog item in BitBucket is copied to a BitBucket issue, all pushes to BitBucket are logged into a Log list in Trello) – avoids the need to continuously look in two locations for info. It should work with other on-line version control systems, I guess. It could also be used to sync info with other analysis systems but I haven’t experimented with that aspect yet. This is a clear and concise article, thanks for posting it. I am looking for is a way to track story points on stories and time on multiple tasks within each story. I’ve been searching for a way to do this on Trello and am not having much luck. You mention breaking stories into task cards to track time. This sounds like what I am looking for but do you mean break down the stories into task and use time *instead of* story points? Thanks for reading! I had intended that tasks be broken out into separate cards and use ‘time’ units on those cards. You can always label to distinguish between stories and tasks. Thanks, Jason! When you separate them, then there is no linkage between the story and its tasks, which is probably what my original question should have asked. Interestingly, I just happened to stumble across a possible solution to this that I am going to try. Each card has a URL and you can embed URLs in text. Because of this you can create a checklist item in the story card that consists solely of the URL for a task card. Creating several such checklist items results in each checklist item having the description of a task and a link to that task. When you bring up the story card you can click the link in a checklist item and the task card will be displayed. You can use the back button in the browser to get back to the story card. Yes, great point! I should have pointed out the card links myself. Any checklist item can be converted to a card, and then you can use those links. There is a feature in the comments that makes it easier to embed card links, but I don’t think that’s available in the checklist. So at the very least, if manually embedding URLs is too difficult, you can add a comment to the card and use the card-linking functionality there.